When people talk about pattern match cover-3, they either oversimplify it or talk about it in a way that makes rocket science sound simple. With Nick Saban’s wild success at Alabama, you’ll hear people throw around terms like “rip/liz” loosely and at times incorrectly. Is it zone? Is it man? It could be both. I know it sounds confusing. However, it’s important to understand the coverage and some, but maybe not all, of its nuances if you run a similar system as a high school coach. If you are scouting players from Saban’s system or adopters of the system, you have to understand the techniques and reads that players are using because they’re not always spot dropping or using classic man-to-man techniques. Derrick Ansley was a defensive backs coach for Saban before taking the same position for the Oakland Raiders this year, where they’ll implement pattern matching with defensive coordinator Paul Guenther. He led a clinic about their base cover-3 at the Nike Coach of the Year clinic in 2017 and did an excellent job of breaking it down and simplifying it. I’ll be using notes from the clinic to supplement this article. For simplicity&apos;s sake, we’ll be talking about pattern match cover-3 out of nickel, which is used more than base in today’s football because of the rise of spread offense and 11 personnel (1 back, 1 tight end, 3 wide receivers). “Flex” tells the front how to line up, but we aren’t discussing the front or run fits right now. “Six” is the coverage and tells the secondary it will rotate toward the weak side. “Bail” tells the corners what technique they are going to use. The corners will almost always cover the number one receiver, but with an emphasis on not getting beat deep. Though the coverage could turn to cover-1, they won’t be as aggressive coming up on short routes and will shuffle to make their reads and get depth. Saban also teaches his corners to shuffle rather than back pedal. He explains his reasoning here. Corners could also make an “under” call if the receivers run a route underneath five yards, which will just turn the coverage into a true cover-3 zone. More on that later. The defense will initially show a two-deep safety look. “Six” is the coverage call, so the safeties know one of them will rotate toward the weak side — they will have to identify the weak side based on the offensive formation. If they determine the weak side is on the left, they’ll make a “liz” call and the left safety will rotate to the left. If the weak side is on the right, they’ll make a “rip” call and the safety will rotate to the right. Ansley explains, “The ‘star’ is our rover. He goes to the passing strength of the formation. The rotation takes place away from the ‘star.’” So against a 2 x 2 formation, the star and safety should be on opposite sides. The star will be on the strength of the formation while the safety will rotate to the opposite (weak) side. 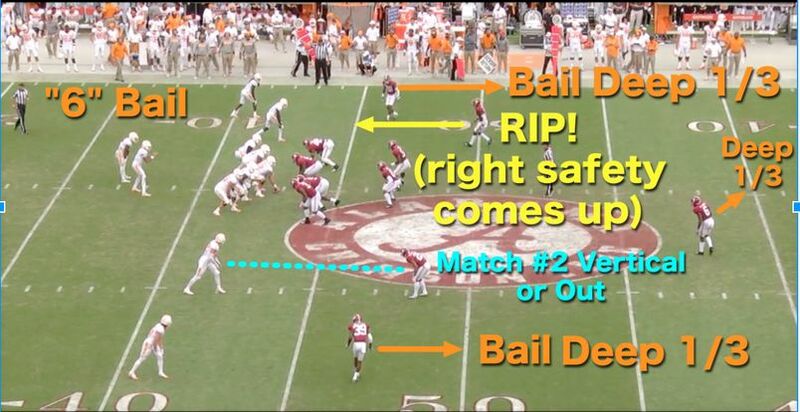 Here, the right side (top of the screen) is the weak side, so the call is likely “rip match left.” The right safety (No. 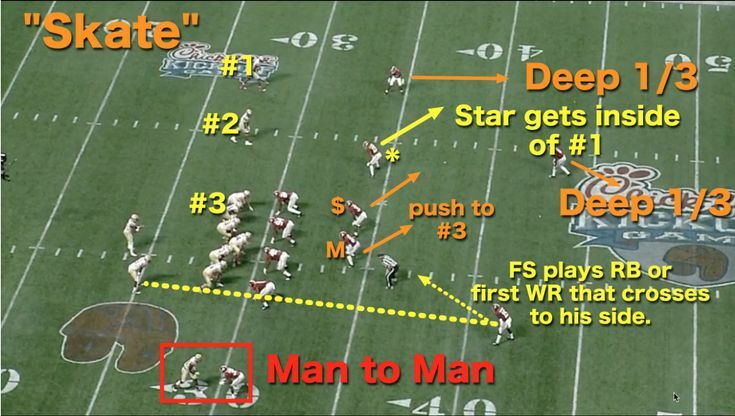 15) rotates down and will “match” the slot receiver while the star will “match left.” The slot releases vertical so the safety covers him man-to-man, but attempts to stay on top of him and push him toward the seam where there is potential help from the hook player or free safety. The corner bails, but has to rally up if the receiver runs a curl. The rip/liz safety and star could make an “under call” if the No. 2 receivers run a route under five yards or break inside under five yards, which would essentially convert that side of the defense to a regular cover-2 zone. Because the No. 2 receivers on both sides ran vertical, there was no “under” call. The linebackers have to figure out who is going to be the “final 3” receiver. It could be a back coming out of the backfield or a receiver running into their zone from the other side of the formation. Final 3 - third-closest receiver to the quarterback after the route distribution. In the clip above, both the Mike (M) sees the running back on his side release toward the other side on the screen. The back should actually be the Sam’s ($) responsibility because he becomes the “final 3” receiver on the Sam’s side, but the Sam doesn’t see the back release for a screen quick enough to make a play and ends up getting blocked, which springs the play for good yardage. As mentioned earlier, either the star, liz/rip safety, or corner could make an “under” call if either the No. 1 or 2 receiver runs a route shorter than five yards. Threy have to make that call within the first five yards of the route. The inside linebackers (Mike and Sam) have to be alert for an “under” call. If they hear it, they have to play regular cover-3 zone and are “hook” defenders. 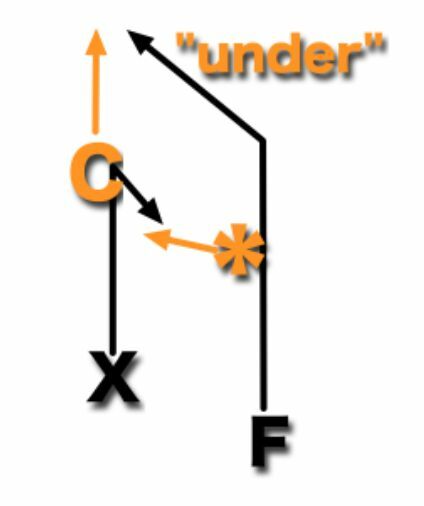 If the hook defenders hear “under,” they have to look for receivers who work inside and also know that they’ll have the star or rip/liz safety helping them outside for curl/flats. If the No. 2 receiver runs a wheel route, the flat defender is responsible for it. 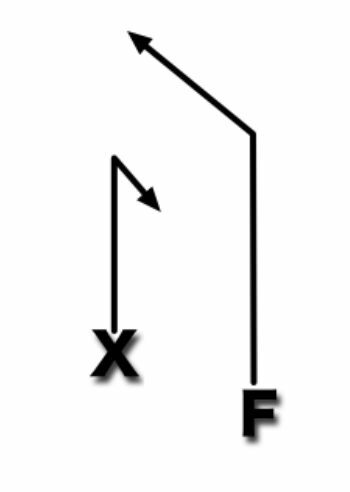 The weak side of the formation is to the defensive right, so the defense makes a “Rip” call for the right safety to rotate down to match the No. 2 receiver. The No. 2 receiver runs an arrow route underneath five yards, so the safety makes an “under” call to convert the side into regular cover-3. The Sam linebacker to that side gets the under call and knows he is a hook defender and has to get depth and does. He drops right into where the quarterback tries to throw the post route to the No. 1 receiver and tips the ball for an interception. To play the combination without an “under” call, the corner and either the star or rip/liz safety would play it like cover-1. As you can see, because the corner is bailing or shuffling out, the hitch route is left open. Saban’s philosophy has always been to let the underneath routes go and rally up and make tackles with superior athletes. Most teams would be reluctant to continually take short passes all the way down the field. However, if a team keeps throwing the hitch, the corner could make the “under” call, which means the safety or star would buzz out to the defend the hitch while “The corner has to accelerate to make sure he can cover the flag route running up the seam,” explains Ansley. Against a 3 x 1 formation (three receivers to one side and one to the other), Alabama will check to “skinny” coverage. The corner to the one receiver side will play man to man on that receiver. The free safety will either play the running back to his side or look for the first crosser from the other side of the formation. The strong safety has a deep third. The cornerback on the three receiver side has a deep third. The Sam will push toward the No. 2 receiver. The Mike will push toward the No. 3 receiver and carry him (play underneath him) if he crosses the field. The weakness in the defense is either one-on-one matchup to the single receiver side, but Saban could also make a call to double a receiver with the free safety with the same look if an offense is exposing that matchup. Another weakness is that there is no underneath coverage toward the No. 1 receiver on the three-receiver side. This is by design because offenses typically don’t throw to that receiver because of the far distance from the quarterback. However, if they have a quarterback that could continually make the throw, Saban could call “skate,” which is the same defense, but the star will get inside of No.1 to his side rather than match No. 2 vertical or out. 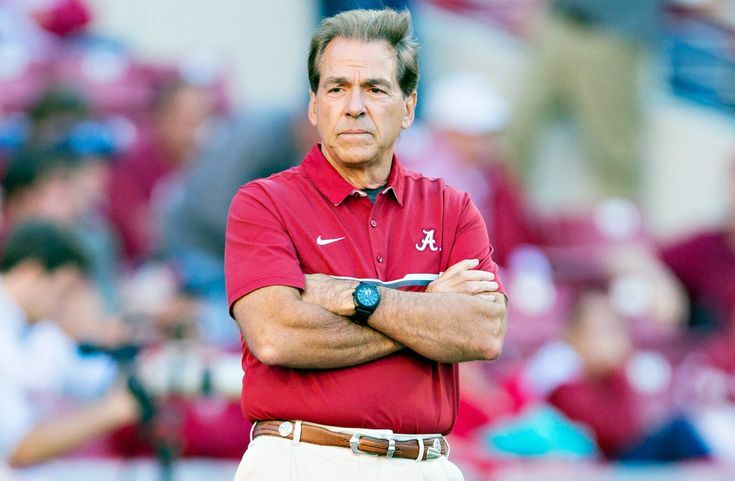 Saban’s system is result of years of figuring out how offensive coordinators want to attack the weaknesses in his defense and coming up with adjustments and answers to address those weaknesses. After over 30 years of coaching, the dialectic process has shaped Saban’s pattern-match cover-3 into what it is now. There’s a lot to it, but hopefully this article gave you a better understanding of that system.